That the grotesque losses of the private sector are to be nationalised, cut from our schools and our libraries, our social services and our healthcare, represents a policy so shameful I doubt that this government will ever live it down. Perhaps it is because they know what the history books will make of them that our politicians are so cavalier with our libraries; from their point of view, the fewer places you can find a history book these days, the better. -- Zadie Smith on Radio 4. That’s twice this week I’ve been left gobsmacked at some frontier gibberish. Let’s deal with the trite conclusion first. If I know anything, it’s that (winners aside) history is written by the academics; an obvious comment perhaps, but important in the context of understanding the filter through which such accounts are already written. When a Labour council closes a library it is the fault of the Conservative-led government; if the Conservatives turned water into wine, history would conclude that Labour could have done better. What really grates though is the dubious grasp on economics. I’ll tell you Ms Smith who’s really paying for ‘the grotesque losses of the private sector’; it’s the rest of the private sector - they’re the only ones who pay for anything. I’ve seen company pension contributions stopped and most of my colleagues made redundant, others have taken pay cuts or enforced shorter hours; do let me know when you’ve caught up. During good times and bad, it is the private sector that pays (directly or indirectly) for ‘our schools, libraries, our social services and our healthcare’, all that has changed is the amount of money available; and incidentally, since spending on the NHS is increasing, perhaps you could explain how this constitutes a cut, or did you feel duty-bound to throw in that old chestnut? In the summer of 1996 I packed a few books for holiday, including one that I was perhaps half way through reading; A Prayer for Owen Meany. I remember finishing The Remains of The Day, a book as disturbing as it was sad, even more so than the film. I know I read a few others, perhaps another John Irving, but I can’t remember why I stopped Owen Meany as it was terrific, perhaps I thought it too good to waste on the sun? Whatever the reason, the book remained in the suitcase and wasn’t removed until I returned home – where it was placed on a bookshelf to gather dust. Last week I decided to pick up where I left off 15 years ago. Actually, since it was that long ago I decided to recap from the beginning and I’m glad that I did. I found myself laughing at the same places as before; Owen’s part in the nativity play had me in tears, and how many books have managed that? More surprising was my reaction to John Wheelwright, the narrator of a story told in extended flashback. As is usual for this style, we are more interested in the story than the ‘present day’ interludes but this time around I am struck by another thought; the older John Wheelwright is so tiresome! The narrator’s target is Reagan, but since there’s been quite a few since then I can’t help wondering; is there a Republican president that the Democrats haven’t wanted to impeach? This is possibly a little unfair because the Republicans are more than capable of dishing it out; from laughable suggestions that Obama is a communist to impeaching Clinton, who to be fair did lie under oath, but I guess it wasn’t a big lie or it was the kind of lie that’s OK. But I digress, I’m curious that it should bother me more now, when my own political views are, shall we say, less strident than before. Was it because in ’96 there had been 17 years of a Conservative government, and one felt obliged to listen to an alternative voice? Or was it because I was still in my twenties (just), where I could relate to an earnest attitude, albeit one in danger of tipping over into boorish behaviour. Or am I just as tiresome? I think I am still reeling from Ed Miliband’s nonsense on the weekend, and as a result perhaps a little less predisposed towards our storyteller. And it’s a good story, I’ve almost caught up to the part where Owen helps John avoid the draft, it will be all new from there on in. Of course it’s Owen I really want to hear about, but I wonder about John too. What calamity waits, what event transpires allowing me to bridge this gap? I suppose that means I care, and I hope we can be friends; what greater achievement than to make a friend with whom you disagree. We come in the tradition of those who marched before us; the suffragettes who fought for votes for women and won, the civil rights movement in America who fought for equality and won, the anti-apartheid movement who fought the horror of that system and won. Our cause may be different but we come together today to realise our voice and we stand on their shoulders. We stand on the shoulders of those who have marched and struggled in the past. I can only hope that the unfortunate timing of Ed Miliband's speech at the anti-cuts 'march for the alternative' rally, which coincided with the moment some idiots started to smash up London, won't distract from his staggering lack of perspective. Indeed, given that before the election the then Labour chancellor Alastair Darling was warning of cuts from his own party that would be "deeper and tougher" than the 1980's, there's the faintest whiff of hypocrisy. Lots of reports today on a study of census data taken from nine countries; which has extrapolated religious extinction. It’s an interesting conclusion because, Voltaire’s comment aside - “if god did not exist it would be necessary to invent him”, I had always assumed this end. However, I have history in blurring the boundaries; my experience of religion, when religious, was generally of the positive. To me, even when I did belong the Bible was more metaphor than fact. I can’t remember whether I stopped believing before or after I began to see the ‘will of God’ as more important than the figure, since foremost had always been the message; Love. As if stringing words together into sentences and gathering sentences into paragraphs wasn’t difficult enough, I now have to learn to count. The English Baccalaureate consists of six subjects, not five, unless you count ‘science’ as one subject in which two passes are required, which is confusing. I blame a post on the BBC website which stated ‘five’ but counted two as one, not helped by (possibly inaccurate) reports from last year which suggest that from the time it was first mooted the science part of this new benchmark has been beefed up. Never copy other people’s homework. I am both exasperated and amused by the reaction to the introduction of the English Baccalaureate. The response has been much the same as when school ‘league tables’ were introduced, with an additional complaint thrown in for good measure. The familiar concern is along the lines of different populations and diverse backgrounds making any such measurement ‘unfair’, or that some children are better suited to vocational study. I have some, but not much, sympathy for this view; because whilst the make-up of the school provides context for the answer, it is irrelevant to whether the question should be asked. As an average parent living in an average area, I fully expect there to be disparity between my local schools and those in a more affluent part of the country; where practically possible, I also have every right to know what those differences are. The English Baccalaureate takes existing data and measures how many pupils achieved passing grades in five ‘core’ subjects; maths, English, two science, one foreign language and either history or geography. There is no additional work for school, teacher or (most importantly) pupil, yet the same tired arguments have resurfaced along with a new and equally irrelevant grievance; that this measurement has been applied retrospectively. I might as well complain that a distance once measured in yards is now given in metres. And what’s to stop the IPPR, teachers unions or other agitators from crunching the data on a different set of subjects, creating their own Baccalaureate if you will? Indeed, the correct question for the Commons Select Committee is not “why those particular subjects” but, given the internet, why not in addition allow the public to compare schools based on selected subjects of their own? It’s only information, why so afraid? Whereas I can easily pin-point the moment when athletics died, with Ben Johnson in 1988, football isn’t so easy to discard - the nonsense off the field is part of the drama, hell I miss Jose Mourinho, but I doubt I’ll ever miss Alex Ferguson. I couldn’t care less about mind games, they’re puerile and a fall-back for lazy journalism, but I do care about the use of debatable decisions to question the integrity of others. …you want a fair referee. You want a strong referee anyway and we didn't get that. I don't know why he's got the game. I must say that when I saw who was refereeing it, I feared the worst. 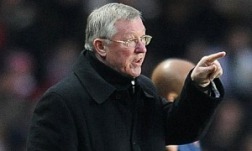 Last season Ferguson received a two match touchline ban (with another two suspended) and a £20,000 fine for questioning the fitness of the referee Alan Wiley. Doubtless the defence for his attack on Martin Atkinson will be a couple of controversial incidents that went against Manchester United, a defence that is completely irrelevant. It’s OK to say the referee made a mistake, but it is simply not acceptable to say the referee made a mistake and from this insinuate that he is corrupt. More than that, it’s pathetic. Doubtless he’s already forgotten Wayne Rooney’s deliberate elbow in the head of Wigan’s James McCarthy – the assertion that there “was nothing in it” was absurd. One hopes the Football Association will pull their finger out, put the boot in, and inflict a punishment appropriate for a repeat offender. So I use the Chrome browser and have done ever since it came out. It has a clean interface, it's beautifully simple to use and it's as fast as they claim; on those occasions when I open Firefox - for the "what does this look like in other browsers" test - I find myself drumming my fingers waiting for it to load. I particularly like the Gmail desktop notifications that Google now support for their browser. I might as well comment on the online music business as to Google's use of HTML5, but what it has impressed on me is that slow move away from applications running on a desktop operating system, to those running on the web. At home I've recently found myself closing Outlook and keeping the browser open - and of course that's what Microsoft is afraid of.